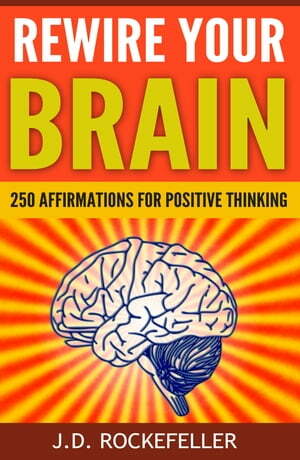 Collins Booksellers - .Rewire Your Brain: 250 Affirmations for Positive Thinking by J.D. Rockefeller, 9781310628207. Buy this book online. Surely you have heard the saying, “You are what you think!” This statement tells us in order to be an effective, positive and motivating person; we must embrace positivity in our thinking. However, until recent years it was not realized that this is more than “just” a good idea. There are actually physical changes that take place in the human brain when we produce and act upon positive energy. Affirmations allow us to re-wire our brains. With each positive affirmation, we produce a hormonal change that actually raises our level of “feel-good” neurons. The more we exercise our brains in this manner, the easier it becomes to empower ourselves! When we affirm our visions and desires, we are invested and enabled to make them our reality. The following affirmations are the tools you need to change your world!